Nov 2 2017 - And yet the approach of the government has demonstrated exactly that. The home ministry’s statement to the media stated that the purpose of the minister’s recent visit to Burma was to attend a meeting on cooperation between Bangladesh and Myanmar on border and security matters. And therefore one would not be wrong to say that the government has so far treated the Rohingya issue as a border and normal law enforcement matter. However, according to the home minister’s statement on Oct 12, “Our main agenda in the discussions will be repatriation of the Rohingyas who have entered Bangladesh and stopping a recurrence of such events,” is a matter which to my mind should have best been left to the foreign ministry, and the foreign minister’s visit to address the repatriation issue would have been in order. To my mind the Rohingya and security does not fall within the ambit of the home ministry’s remit, unless of course the Prime Minister, who also happens to be the defence minister, had tasked the home minister to talk these issues too. But again, the usual caveat that Myanmar foists on the progress to the path of a quick resolution of the problem is the 1992 Agreement. And only recently Myanmar made the most ludicrous comment that Bangladesh is delaying the process of repatriation to attract more foreign aid. So whatever Suu Kyi says is subtly countermanded by the Generals. The devious mind of the Myanmar general puts even the satanic innovations to shame. That Aung San Suu Kyi is not in charge in Myanmar has been all but clear for a long time. She does not call the shots, and is quite happy to let the military run the affairs of the country. For a person who is supposed to have fought for democracy and the rule of the people in her country, that is an odious compromise for her political survival. It is not really the rule of the people but a sham democracy with the Nobel Laureate for Peace in the shop window—displaying to the world the “face of democracy” in Myanmar. It is virtually a military rule in the guise of democracy. And it is not the parliament but the military who calls the shots in Myanmar. Therefore, it is not the anointed leader but the real powerbase that should be targeted for the resolution of the Rohingya issue. That, one understands, is a tall order to achieve. Given the deep-rooted strategic-economic interest of some regional and supra regional powers in Myanmar, the reasons for the unwillingness to take action against Myanmar despite the renewed ethnic cleansing of the Rakhine are clear. The US intention to explore ways to impose sanctions on Myanmar is perhaps more substantive than what has been expressed or done by most countries except for the EU. Tillerson’s message to the Army Generals was meant to convey a message. But any demonstrated firm action on the country is going to be restrained by India and China, the two most influential countries that can bear upon the Myanmar military, both with different and conflicting stakes in that country. And this has been amply demonstrated by the Indian call to the US for restraint following US Secretary of State’s veiled threat to the Myanmar Generals. And whatever faint hope there might have been of passing a resolution on the matter by October 31 in the Security Council, the last day of France’s presidentship of the Council and who had circulated the draft to all members of the Council was dashed, because neither Russia nor China had consented to the draft. But while we are calling upon the international community to assume a more stringent posture against the military regime in Naypyidaw, our business-as-usual posture with Myanmar will certainly dilute the gravity of the situation. First it was the visit by our food minister to that country to purchase rice, in the midst of the persecution and exodus of the Rohingyas which was creating the most severe problems for Bangladesh. While the normal diplomatic lines of communications must never be disrupted, we cannot pretend as if nothing has happened between the two neighbours. That would convey the wrong message to the world, and certainly to the military junta in Myanmar. And now we have the MoU signed during the home minister’s visit. We are not aware of the details of it, but if the comment of the Myanmar government’s permanent secretary for home affairs following the signing of the MoU is anything to go by, it shows that not only has the ball been deftly sent back to our court, it reads as if it is Bangladesh’s responsibility to stop the Rohingya exodus. The onus of the problem has been made to devolve on us by very intricate and skilful use of language. The two statements merit dissection. The comments interestingly read, “The two sides have agreed to halt the outflow of Myanmar residents to Bangladesh”, and “form a joint working group”. And, “the two countries agreed to restore normalcy in Rakhine to enable displaced Myanmar residents to return from Bangladesh at the earliest opportunity”. Excuse me! 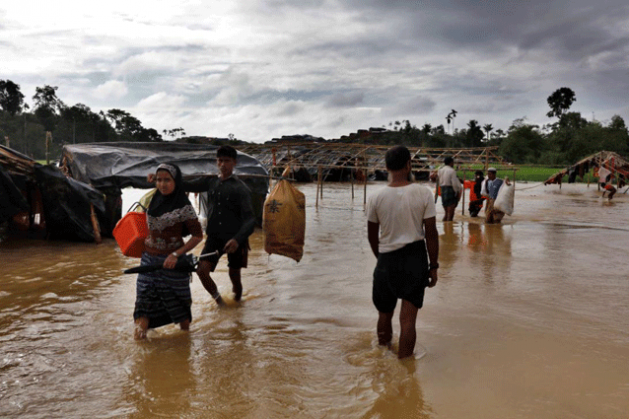 How is it up to Bangladesh to halt the outflow of the Myanmar residents? Unless of course Myanmar allows Bangladesh forces to sanitise the Rakhine State. And notice how subtly Myanmar avoids referring to Rohingya as “citizens” by terming them “Myanmar residents.” And how is it Bangladesh’s responsibility to restore normalcy in the region. Is that the preamble of the proposed Joint Working Group? One wonders whether we have unwittingly become a party to the resolution of the conflict in Rakhine. This is a question the policy makers should seriously ponder on and provide an answer to.